Young Alanna dreams of becoming a knight. Her twin brother, Thom, wants to train to become a sorcerer. When the two are sent out to accept training as a lady and a knight, the twins conspire to switch places. Thom continues on to The City of the Gods to receive training as a sorcerer, and Alanna disguises herself as a boy to begin training as a page. 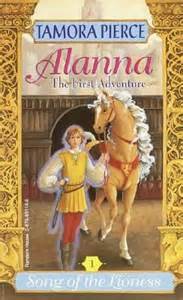 Alanna adopts the name “Alan” and cleverly hides her gender from the other pages. She is befriended by several other trainees, including Prince Jonathan of Conte. With hard work and perseverance, Alanna becomes an exemplary knight in training. As she becomes older, it becomes increasingly difficult to hide her identity, but she is fearful of what will happen if she is discovered. When the kingdom is besieged by a threat and the prince decides to attack it head on, he takes Alanna with him. The event sharply brings into question her ability to hide her gender forever, and Alanna must face the unknown consequences of a potential unveiling. This book is the first in an incredible series. Alanna breaks all gender barriers and norms with her strong will and determination to become a knight. Although she struggles to blend in and conceal her gender from her peers, she handles all adversity with a keen inner strength and refusal to give up. She serves as an ideal role model for young girls because she is loyal and has a fighter’s spirit. All things worth obtaining in life are difficult to achieve, and she demonstrates that the payoff is worth the risk. She never compromises who she knows herself to be, and her character remains steady throughout the book. Reader’s Annotation: Alanna dreams of being a knight. The only problem is, women are not allowed to be. Alanna must break all gender norms to conceal her identity and follow her heart. Describe Alanna overcoming her bully. Describe Alanna’s daily routine to conceal her gender. Justification of Selection: This is a great adventure story with a strong female protagonist. The main character breaks down gender barriers, and proves herself to be more than capable of assuming a traditionally male role.